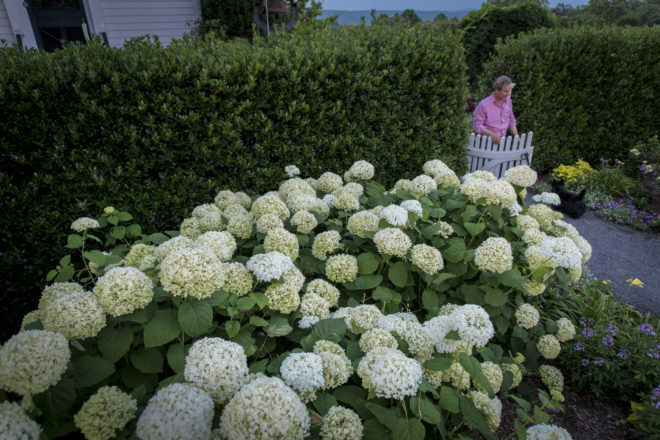 I am hard-pressed to name a shrub that matches the hydrangea for drama, splendor, and elegance in the garden. 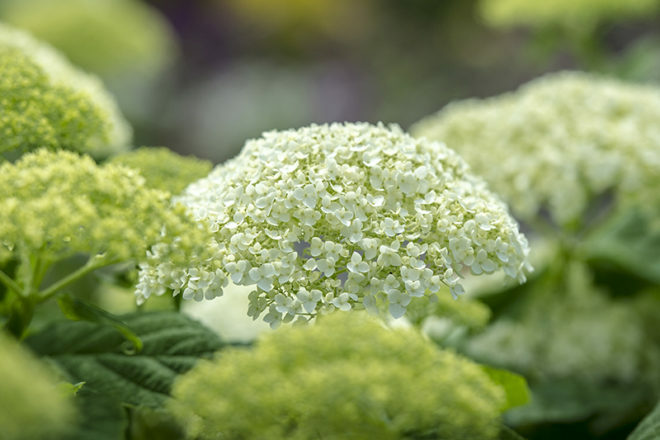 From the subtle white starry-shaped lacecap flower of ‘Hayes Starburst’ to the dramatic, large white globes of ‘Incrediball’ – one of my favorites – there’s a hydrangea to fit almost any spot in the garden. And with more advances in plant breeding, hydrangea selection has continued to expand to meet the still-growing demand for new plants. Now gardeners can choose from a wide array of re-blooming mopheads, a variety of new flower color options, and a multitude of dwarf sun- or shade-loving hydrangeas, starting at 12 inches in height. It’s a great time to discover the versatility of this flexible shrub, or reacquaint yourself with a plant that you might have written off as old-fashioned or poor blooming. Make no mistake – today’s hydrangeas are versatile, dynamic, and easy to grow. While there are thousands of different hydrangeas and cultivated varieties, I’m going to talk about four main species and some of the varieties you may want to be on the lookout for: H. arborescens (smooth hydrangea), H. macrophylla (bigleaf hydrangea), H. paniculata (hydrangea paniculata), and H. quercifolia (oakleaf hydrangea). And while the different hydrangea species vary greatly, they all benefit from being planted in soil that is rich in organic matter and sited in a location with moist but well-drained soil. Adding compost or manure when planting will help with moisture retention, and, ironically, drainage. 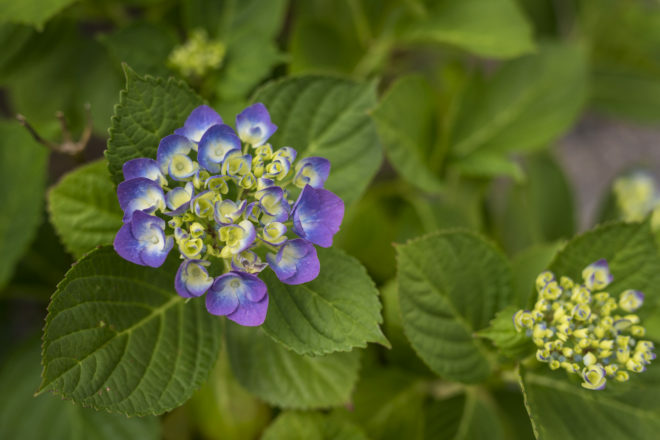 Despite its water-loving name, you don’t want your hydrangea to sit in soggy soil. Hydrangea arborescens, or smooth hydrangeas, grows best in morning sun and afternoon shade. The large white flowers age to a limey-green and make a beautiful cut flower. H. arborescens is one of the hydrangea varieties native to North America, which makes it a fairly care-free selection. Hardy in zones 3 to 9, ‘Annabelle’ is probably the most well-known arborescens with large white round mophead flowers. It grows to about 4 feet by 4 feet, but blossoms will flop to the ground when it rains. 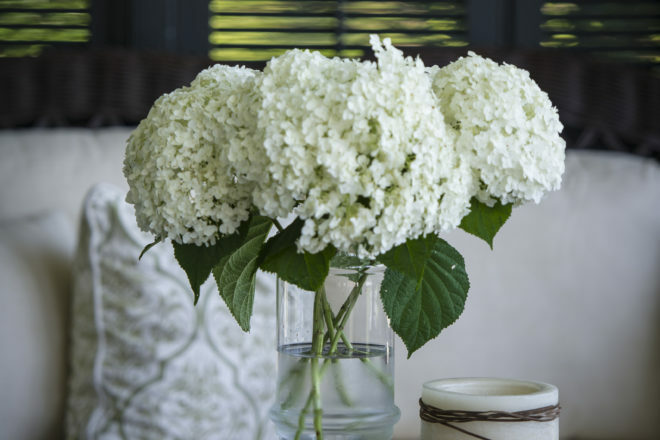 Lucky for us, plant breeders have introduced an improved ‘Annabelle’ with thicker stems for more support – the ‘Incrediball’ hydrangea. ‘Incrediball’ makes a spectacular hedge, is great for cut flowers, and can be enjoyed as a specimen plant or placed in the back garden where its blooms can even be appreciated from a distance. And the variety just gets better. New this year is the dwarf version of ‘Annabelle’ – the ‘Invincebelle Wee White.’ At just 2-feet by 2-feet, this little powerhouse gives you abundance of white flowers in a mini form. Also new is a pink/mauve version – ‘Invincibelle Mini Mauvette.’ It stands at about 3-feet tall and wide with strong stems. This species blooms on new wood, or the current season’s growth, so you don’t have to worry about improper pruning, hard winters, or late freezes that might kill off precious flower buds. They are best situated in morning or dappled sun. Plant breeders have come through with new hydrangea varieties that bloom on both old and new wood. The leader in this field is the ‘Endless Summer’ series of hydrangeas, including the original ‘Endless Summer,’ which blooms pink, purple, or blue, depending on your soil pH and measures about 4 feet by 4 feet. It’s hardy in zones 4 to 9. Its sister plant, ‘BloomStruck,’ has similar flowers on dark purple stems. ‘Blushing Bride’ is a white version that is hardy in zones 5 to 9, and ‘Twist-n-Shout’ is a beautiful lacecap variety with red stems, hardy in zones 4 to 9. And more remontant varieties are coming out every year. I especially like ‘Let’s Dance Rhythmic Blue,’ which is about 3 to 4 feet tall and wide and hardy in zones 5 to 9. But just like Nikko Blue, ‘Rhythmic Blue’ flowers will actually be pink in alkaline soil, so you may have to amend your soil with an acidifier product to create blue flowers. H. macrophylla perform best when situated in morning or dappled sun. Gardeners with full sunlight should consider the paniculata hydrangeas, so named because of their panicle-shaped flowers, which open a creamy white and age to a dusty rose as the summer progresses. And because they bloom on the current season’s growth, paniculatas are reliable, hardy bloomers. One of the best-known and hardest working paniculatas is ‘Limelight,’ hardy in zones 3 to 9 and reaching up to 8 feet tall. 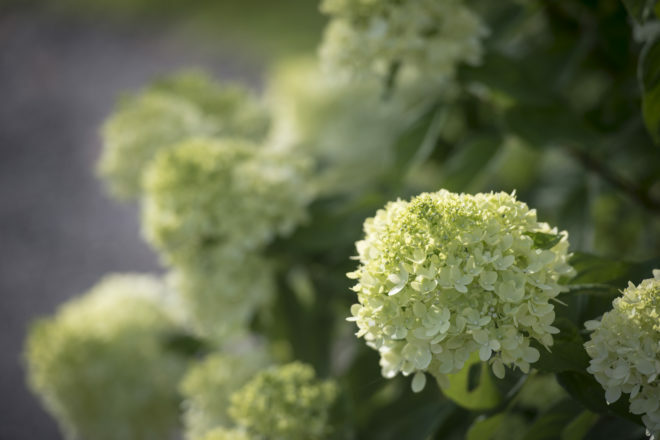 But if that’s too much hydrangea for you, consider ‘Little Lime,’ a dwarf version that you can keep to about 3 feet tall with late winter or early spring pruning. Other dwarf H. paniculatas worth considering include ‘Bobo’ and ‘Little Quick Fire,’ both hardy in zones 3 to 8. H. paniculatas are the only hydrangea variety that will perform happily in full sun, but will also take part-sun. Oakleaf hydrangeas are the other hydrangea species native to North America, making them low-maintenance, reliable, and outstanding in beauty. They also have the distinction of being a true, four-season shrub, with oak-leaf shaped foliage in spring; large, creamy white panicle flowers in the summer that age to a rosy hue; beautiful fall orange, red, and gold fall foliage; and an ornamental cinnamon-colored peeling bark that is visible in the winter. If you don’t have an oakleaf hydrangea already, then put it on your wish list. The true oakleaf species can reach 8 feet or taller and just as wide, so it’s not for the faint of heart. But if you’ve got the room, nothing beats the majesty and size of its foliage and flowers. More manageable oakleaf hydrangeas include ‘Snow Queen’ and ‘Alice,’ both about 5 feet tall and hardy in zones 5 to 9. Dwarf oakleaf version include ‘Pee Wee,’ ‘Sikes Dwarf,’ and the relatively new ‘Ruby Slippers,’ which reaches about 4 feet tall and wide and has flowers that darken to a more ruby color. It’s hardy in zones 5 to 9. And because oakleaf hydrangeas have woody stems, pruning is not recommended so that the stem’s original character and shape can be appreciated in the winter months. If you need a shorter variety, it’s worth searching for a dwarf form to prevent having to prune for size later. These hydrangeas prefer to be located in morning or dappled sun. 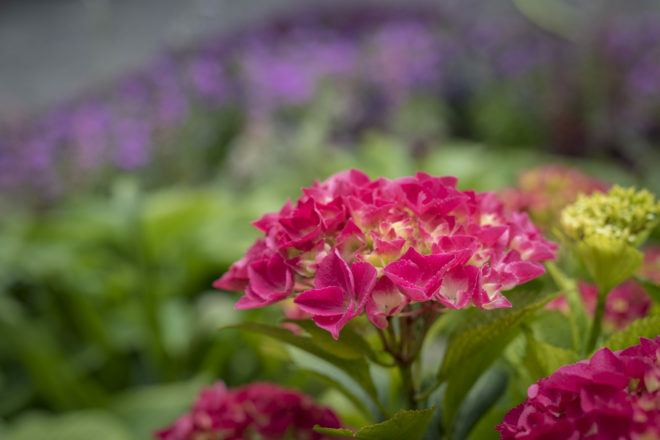 Hydrangeas are available today in more colors and sizes than ever before, and with advances in plant breeding and growing consumer demand, the future looks bright for even better selections. Heirloom hydrangeas will always have a place in the garden, but I hope you consider one of the newer varieties if a spot opens up in your garden. You’ll be amazed by their performance and ease, which are plant traits that all of us gardeners seek. I planted a purple/blue hydrangea that came from my mother’s in 2014, it has beautiful green leaves every year, but never has bloomed. Any advice? I have a red stem lace cap hydrangea I received as a gift in 2006. The tag read “Red Lady”. I planted it in morning sun, without shade until about 3 PM, and though I gave it plant food and made sure it had adequate water when the weather was dry, it never bloomed. About 5 years ago I moved it to a spot on the southwest side of the house that has dappled shade. It has bloomed a couple of times, but no more than 4-5 blooms total. This year it had only one small bloom. The foliage is beautiful, thick, dark green and healthy looking. But no blooms!!! Advice please!! !